Once upon a time, Westport was filled with illustrators. Men — there were virtually no women — who drew New Yorker cartoons, syndicated comic strips, magazine covers, advertisements and cereal boxes lived all around town. They worked in their home studios, but they got together often. They saw each other at the train station, where they sent their work via couriers (or friendly conductors) to their bosses in New York City. They met for lunch, dinner and (especially) drinks, at restaurants in Saugatuck and downtown. They picked up side money as “faculty” of Famous Artists School, and contributed drawings to their kids’ schools’ PTAs, the Yankee Doodle Fair, and every other fundraising opportunity that asked. Westport is no longer filled with illustrators. For one thing, they can’t afford to live here. For another, they can live anywhere. They work remotely, and don’t need a community of fellow artists to give emotional support and recommend new clients. For a third, their “community center” — the great and much loved Max’s Art Supplies — is closed. Artists now buy their supplies on the internet. But the field of illustration is going strong. There is work to found in films and video games. Young people — those who don’t want to work on Wall Street or Silicon Valley, anyway — would love to get in on the action. There are still a few illustrators left in Westport. And one is helping pave the way for the next generation — if not here, then anywhere. 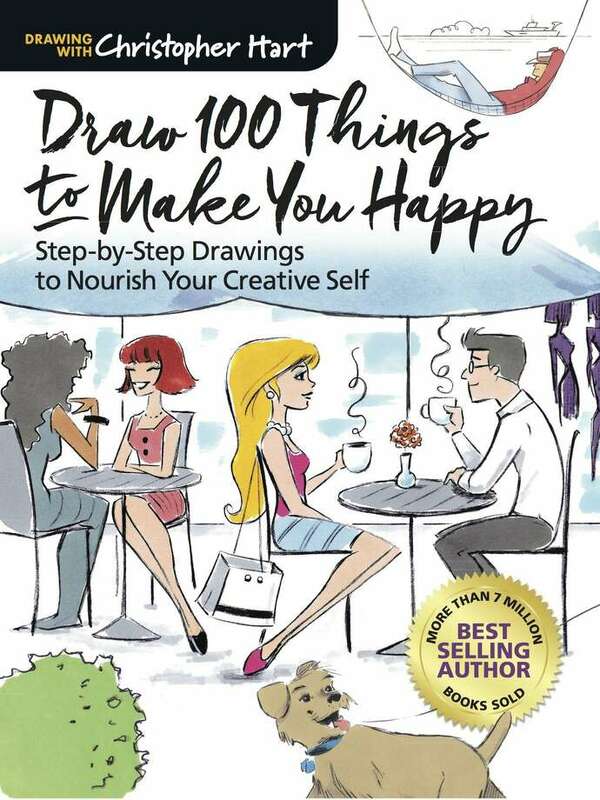 Chris Hart is the world’s best-selling author of how-to-draw books. He’s published over 100 titles. His books have sold more than seven million copies, and been translated into 20 languages. At one point, he authored the three most popular art books in the country. Hart was born in Brooklyn. His parents had a summer home here for a year, when he was 10. A year later his family moved to California. He studied at the California School of the Arts, and earned his bachelor’s at New York University. He married, and moved out to Los Angeles. An artist can work anywhere, he notes. But he and his wife did not want to raise children there. They could have moved anywhere. They chose Westport 23 years ago for its beauty and educational opportunities. They’ve been here ever since. Hart has found plenty of work with those how-to books, teaching budding artists to draw. Figures, animals, cartoon characters, manga, video games (“they’re not all violent,” he notes) — there’s a lot of work to be had. He advises young artists to first focus on the basics first — a “great-looking character” like the “Incredibles,” rather than worrying how the eyes look. Hart’s how-to-draw books appeal to a variety of audiences. Some are aimed at aspiring professionals. Others are marketed to children. Some simply address the creative spirit (draw 100 things that make you happy). Hart posts how-to videos on YouTube. He has an active Facebook presence. He welcomes questions and tries to respond to every email. But how-to-draw books are not all that Hart does. His work has been licensed to art kits, board games and sports equipment. He wrote original screenplays for 20th Century Fox, the Showtime Television Network, MGM Pathe and Paramount Pictures. After a career in illustration, Hart is bullish on the field. He believes the quality is better than ever. There are plenty of places to work. His main concern is that newcomers get advice from the wrong places. Social media can be a minefield. Better, he says, to learn from pros (hey, that’s why he writes how-to books). Westport is no longer a haven for illustrators. But Hart is not the only one left in town. The other day, he says, several members of the National Cartoonists Society held a meeting here. They work in different areas — comics, books, children’s art — but they shared a meal, and talked about their profession. Just like the old days. And maybe a harbinger of the future.